Pamela is fed up with everyone calling her dumb, so she escapes from the circus. That night she finds a break in the train tracks, and she saves a train. Now everyone loves her. 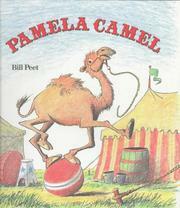 Peet, Bill, “Pamela camel,” Children's Picture Book Database at Miami University, accessed April 24, 2019, https://dlp.lib.miamioh.edu/picturebook/items/show/8745.